Change is a very fascinating word. It is very fast and a never ending process. Change is inevitable and unavoidable. Brand industry is no exception to this phenomenon. In the past few decades, important shifts in branding have occurred. Brands have become one of the companies’ most valuable intangible assets Brands are a complex social phenomena, thus they have become increasingly human-oriented, collaborative, responsible, social, interactive and extremely important. Technology has also made it easier for the people to truly own the brands. As we all know that the power of brands first lay in the hands of the producers then it went to the administrators and them consecutively it went in the hands of the marketing managers and brand managers and finally the consumers. Let’s assume that the graph of this power shift will be advancing in the same direction with the same speed. The technological advances and the consumer using technology to interact with the brands will keep on increasing and thus we will arrive at a state where the entire brand process will be democratized. In olden days, organizations use advertisements and other forms of communication to make people aware of an intended brand meaning within consumers’ minds (De Bruyn and Lilien 2004, Phelps 2005). In the 20th century, mass communication media like TV, radio, or magazines were used extensively to create and shape consumer awareness. In the 21st century, more and more “viral and guerilla marketing” activities are being applied to influence social networks, blogs and online communities in desired directions and “create a buzz” around the brand and its products. So what could be the possible next step in this journey of brands? The days when brands controlled the customer experience are over. The balance of power is shifting. For better or for worse, consumers are now collaborators in brand development. Those brands that embrace and act on this shift will likely be the winners (Cheryl Giovannoni 2007). The ownership of the brands will lie in the hands of those who have maximum power. The ownership of the brands is predicted to be transferred to the customer in the near future. This change is most likely to happen in the form of brand democratization. The idea of brand democratization is very simple, the power of the people is increasing day by day and thus they will be the prime directors of the brands. Whatever people say & act in relation to the brand will determine what the brand will be. The era of this future scenario will be a ‘Brand Democratization Era’. This era has already started. We have developed a conceptual model of the brand democratization era which will give a visualization of how would the brand democratization era would look and what will be the roles of the various players in this era. 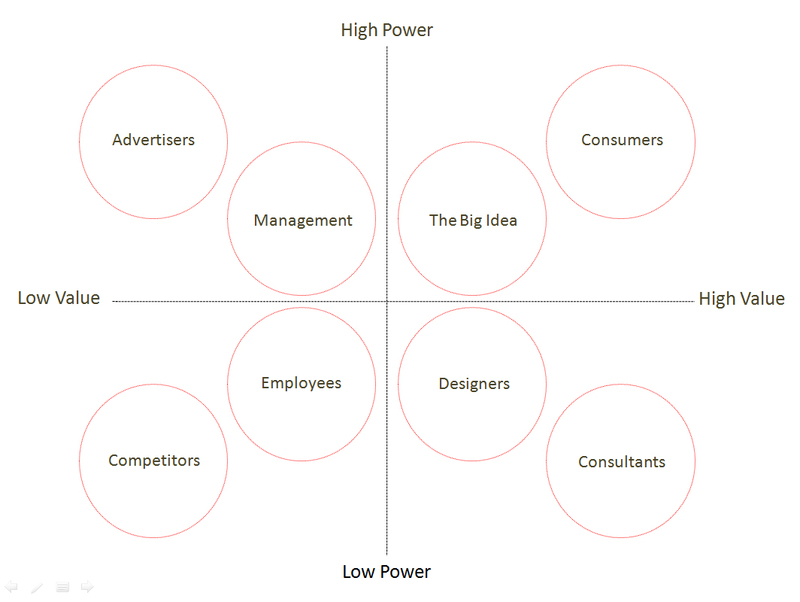 In the following model, we can see the relation between powers, the participants will enjoy and the amount of potential value that they will create in future. Consumers will have highest power and will create highest value in contrast to Management, which will have high power but value creation will be comparatively low. The companies can customize this model according to their brand needs and use it as a guide to develop their strategies for future and capitalize on their investments. Adapting to the change in the brand democratization era is extremely difficult as in this era organizations will have to continually change themselves according to the requirement of the consumers. Keep changing and introducing new avenues to the consumers in terms of products, services and platforms and do it fast. Listen to the consumers and empower them. Brand democratization will keep the organizations innovating. Let consumers come up with solutions that help your brand and solve crucial issues that are relevant to them. This is more cost effective than internal solutions. But don’t rely on consumers to solve issues or add value. Also, empower the consumers but have a control over their power. Brand democratizations is going to make organizations more and more transparent. Thus be more truthful and keep the operations more real. The big idea will play important role in this scenario. Stand for something big. Competition will not copy the big idea, thus adopt a core big Idea and make it real. Simplify brand architecture, and reduce the number of brands in the portfolios. Also reduce the complexity in the processes and operations. Make information available widely so that consumers can use that information. Consumers will neglect the complex business model. Show way to your consumers and make things easy for them to do, lead them in right direction. Offer maximum choices to your consumers and try to make every experience personalized. It will also be very crucial to design new platforms and frameworks for the co creation process. They will have to integrate all the resources and find out different opportunities in the organization where they can involve consumers to be a part of the brand. Develop new devices, portals and infrastructure for this process. Motivate your employees to become friends and partners with their customers. In conclusion, brand democratization is going to be a revolution in next generation. It is unavoidable, thus embrace it positively. The consumers will become advocates of the brands who will have a prime say in the brand decisions but enjoy the position of the owners of the brand.